Note: Includes crude oil and petroleum liquids. Nearly 59 million barrels per day (b/d) of global petroleum and other liquids production moved on maritime routes in 2015, or almost 61% of the world total. Many of these products transited the Suez Canal and SUMED Pipeline, the Bab el-Mandeb Strait, and the Strait of Hormuz chokepoints around the Arabian Peninsula. Chokepoints are narrow channels along widely used global sea routes, and they are critical to global energy security. The inability of oil to transit a major chokepoint, even temporarily, can lead to substantial supply delays and higher shipping costs, resulting in higher world energy prices. Although most chokepoints can be circumvented through the use of other routes that add significantly to transit time, there are no practical alternatives in some cases. The Strait of Hormuz is the world’s most important chokepoint, with an oil flow of 18.5 million b/d in 2016. The Strait of Hormuz connects the Persian Gulf with the Gulf of Oman and the Arabian Sea, and in 2015 its daily flow of oil accounted for 30% of all seaborne-traded crude oil and other liquids. More than 30% of global liquefied natural gas trade also transited the Strait of Hormuz in 2016. At its narrowest point, the Strait of Hormuz is 21 miles wide, but the width of the shipping lane in either direction is only two miles wide, separated by a two-mile buffer zone. There are limited options to bypass the Strait of Hormuz. Only Saudi Arabia and the United Arab Emirates have pipelines that can ship crude oil outside of the Persian Gulf and have additional pipeline capacity to circumvent the Strait of Hormuz. At the end of 2016, the total available crude oil pipeline capacity from the two countries combined was estimated at 6.6 million b/d, while the two countries combined had roughly 3.9 million b/d of unused bypass capacity. The Suez Canal and the SUMED Pipeline are strategic routes for Persian Gulf oil and natural gas shipments to Europe and North America. Located in Egypt, the Suez Canal connects the Red Sea and the Gulf of Suez with the Mediterranean Sea. In 2016, 3.9 million b/d of crude oil and refined products transited the Suez Canal in both directions, according to data published by the Suez Canal Authority. Northbound flows rose by about 300,000 b/d in 2016, largely because of increased crude oil exports from Iraq and Saudi Arabia to Europe. Southbound shipments decreased for the first time since at least 2009, largely because of lower exports of petroleum products from Russia to Asia. The 200-mile long SUMED Pipeline transports crude oil through Egypt from the Red Sea to the Mediterranean Sea. Crude oil flows through two parallel 42-inch pipelines that have a total capacity of 2.34 million b/d. The SUMED Pipeline is the only alternate route to transport crude oil from the Red Sea to the Mediterranean Sea if ships cannot navigate through the Suez Canal. Closure of the Suez Canal and the SUMED Pipeline would require oil tankers to divert around the Cape of Good Hope near the southern tip of Africa, which would add approximately 2,700 miles to the transit from Saudi Arabia to the United States. In 2016, 1.6 million b/d of crude oil was transported through the SUMED Pipeline to the Mediterranean Sea and then loaded onto tankers for seaborne trade. The Bab el-Mandeb Strait is a chokepoint between the Horn of Africa and the Middle East and is a strategic link between the Mediterranean Sea and the Indian Ocean. Located between Yemen, Djibouti, and Eritrea, it connects the Red Sea with the Gulf of Aden and the Arabian Sea. Most exports from the Persian Gulf that transit the Suez Canal and the SUMED Pipeline also pass through Bab el-Mandeb. An estimated 4.8 million b/d of crude oil and refined petroleum products flowed through this waterway in 2016 toward Europe, the United States, and Asia, an increase from 3.3 million b/d in 2011. The Bab el-Mandeb Strait is 18 miles wide at its narrowest point, limiting tanker traffic to two 2-mile-wide channels for inbound and outbound shipments. 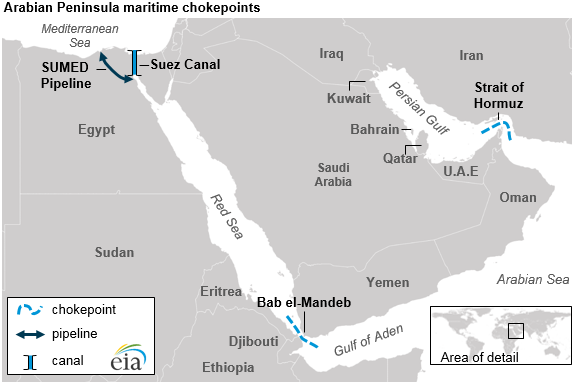 Closure of the Bab el-Mandeb could keep tankers originating in the Persian Gulf from reaching the Suez Canal or the SUMED Pipeline.